Do you want to make a delicious and healthy dinner for your family in just 20 minutes? 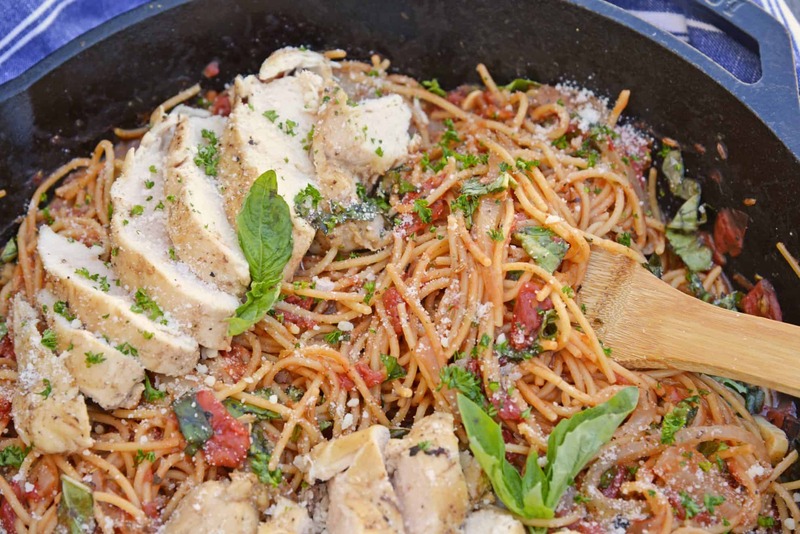 Read on to see how easy it is to make One-Pot Chicken Bruschetta Pasta! 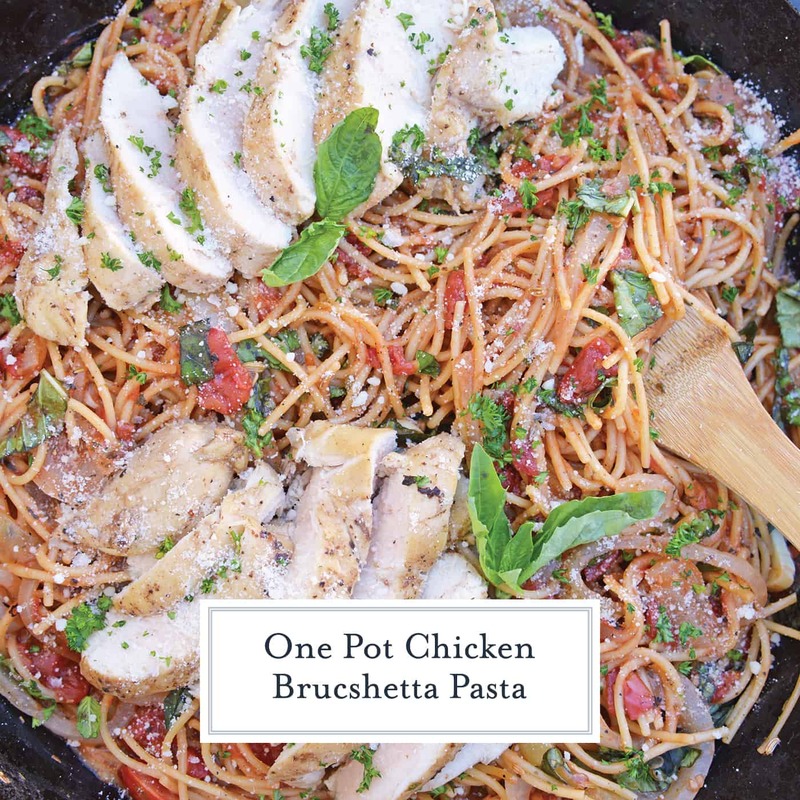 One Pot Chicken Bruschetta Pasta is uses only one dish and a handful of ingredients to make dinner for the whole family. Tomatoes, fennel, Italian seasoning and Parmesan cheese make this a winning dish! No one in history has ever written me and said “I need more 2 hour recipes,” however they have requested more quick recipes. I was excited about the ease of “one-pot wonder pastas” when they trended last year, but had miserable, mushy failures with each attempt. Lucky for you, I’m here to tell you about my recipe that worked. Bruschetta, a classic Italian appetizer, can also make a wonderfully simple, but flavorful pasta. 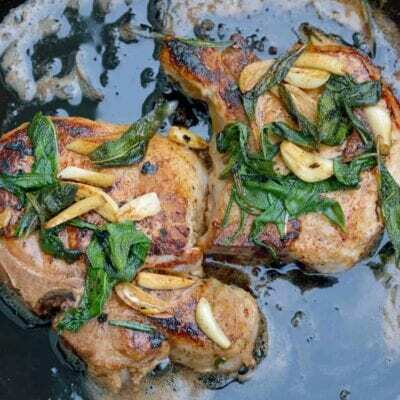 What really elevates this dish is the toasted fennel and fresh basil. 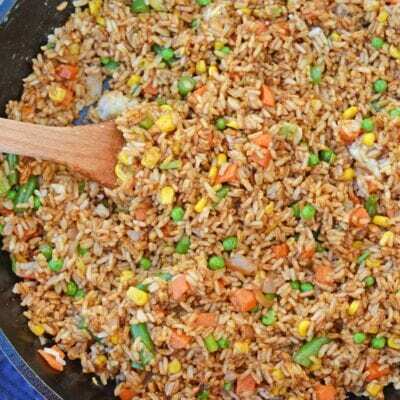 You will only need 10 ingredients and 30 minutes to prepare this simple one-pot dish. PRO TIP- If you prefer to use dried basil leaves, use 1 tablespoons. Rub them between your palms before adding. This released natural oils and more flavor. While this is a one pot meal, it comes in two (three if you decide to mariante) process, but all one skillet. 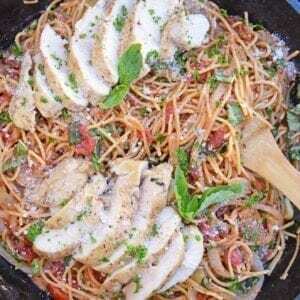 Spaghetti cooks right in the pot without needing any draining. While most people merely think about this being simple and reducing a step and cleaning one colander, I think of it as a way to infuse pasta with SO MUCH FLAVOR! Instead of just water, pasta is sucking up seasoned tomato juice and chicken broth. YUM! PRO TIP: To elevate this dish even further, try drizzling it with a Balsamic Reduction Sauce! Marinating the chicken is totally optional. 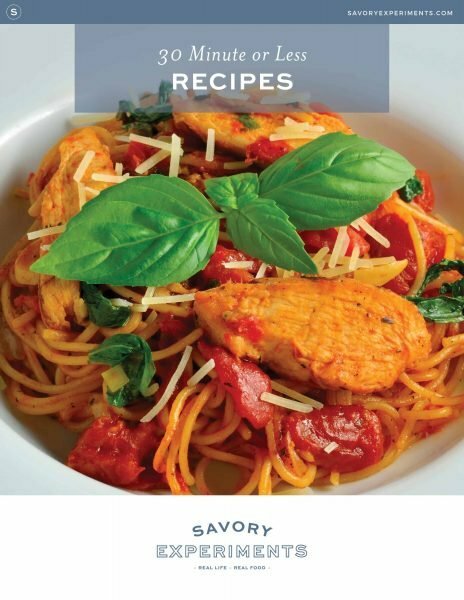 I like the diversity of having vinegary chicken using a balsamic dressing and savory flavors of the tomato based sauce and fresh basil. Fennel really elevates the dish and adds flavor akin to Italian sausage. If your family isn’t down for that or you don’t have fennel, just omit it. PRO TIP- Ground fennel has a lot more flavor than whole fennel seeds. If you need to substitute ground fennel, only use 1/4 teaspoon. The only issue with my One Pot Chicken Bruschetta Pasta, and essentially any one- pot pasta dish, is getting the correct amount of water for the pasta to cook, but not be watery. It is a fine balance and nearly impossible to master. Every brand of pasta will require a different amount of cooking liquid. Other factors like human error, liquid in the tomatoes and altitude will also have an impact on how much liquid you need and cooking time. Some of the preparation and cooking will need to rely on your cook’s intuition. 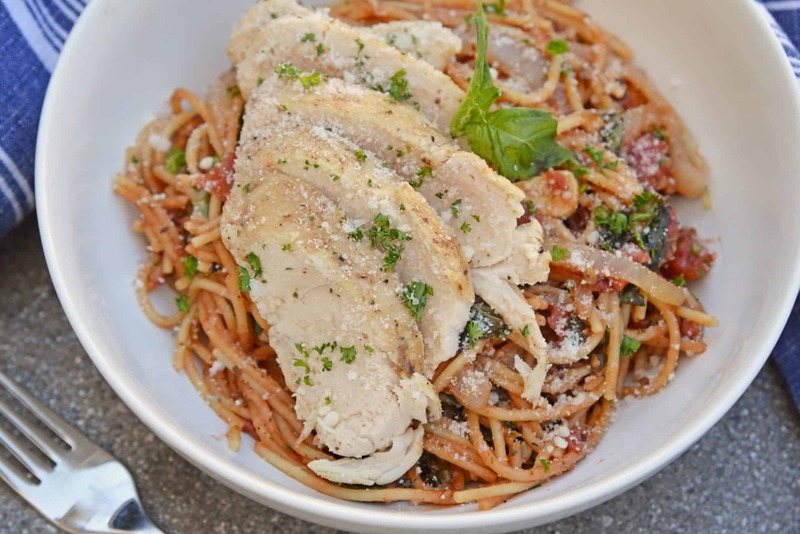 What exactly does “al dente” mean? Al dente translates literally to “to the tooth” meaning that the pasta is a little chewy, has some bite and toothiness to it. Good Extra Virgin Olive Oil– A good olive oil will taste like, well, olives, while a poorly made one will taste like vegetable oil. Gross. While people tend to favor Italian and Greek olive oils, I prefer to buy mine domestically. There are some great ones out there from all over the world, but the reporting of ingredients isn’t always the same and you could find that your super expensive olive oil was actually cut with vegetable oil. What can I substitute for chicken? Anything you want! You can use shrimp, sausage or even make this into a vegetarian bruschetta pasta. Can I make this dish spicy? Spice it up! Hubby likes to sprinkle some crushed red pepper flakes on top or even add 1 teaspoons to the pasta while cooking. You can even add sliced spicy peppers. Can I make One Pot Chicken Bruschetta ahead of time? You can make this dish ahead of time, but I feel like any pasta that is already tossed in sauce tastes better fresh. You’ll lose the al dente factor and it might be a little more starchy. Can I freeze bruschetta pasta? You sure can! Freeze it in an airtight container for up to 4 months. Please be mindful that you’ll run into the same issues as making it ahead of time, it will be a little less al dente and a little more starchy. Using a meat tenderizer, pound chicken breasts into 1/4 inch thick, or a uniform thickness throughout. Cut each breast in half. They are easier to handle when smaller. If you have the foresight or the time, marinate the chicken breasts in balsamic dressing for 1-24 hours. This step is optional. You can omit this and move right to cooking the chicken if you wish. 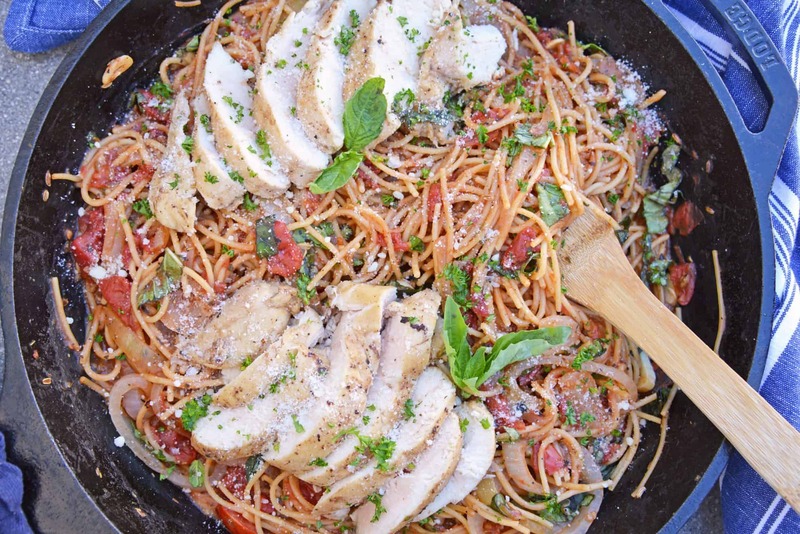 Heat 1 tablespoon olive oil in a very large skillet or cast iron pan over medium heat and add chicken breasts. If you used the marinade, discard leftover marinade. Cook chicken on each side until cooked or internal temperature of chicken reaches 165 degrees, approximately 5 minutes. Remove from pan and set aside. Slice after resting. Heat additional 1 tablespoon olive oil in the same pan without wiping it out. Add onions and garlic, saute for 2-3 minute or until they start to soften. Add fennel seeds and continue to heat for 2 minutes. Strain canned tomatoes over a large measuring cup (will be approximately 1 cup). Add water to make a total of 3 1/2 cups liquid. Add chicken bouillon cube and stir. Break spaghetti into thirds and add to the skillet, spreading out evenly. Pour 3 1/2 cups liquid over the top. Add strained tomatoes and Italian seasoning. Cook for another 5 minutes (10 minutes total). Remove from heat and toss in Kosher, black pepper and fresh basil leaves. 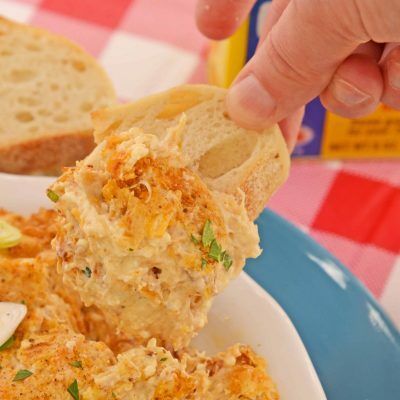 Spoon onto serving dishes, top with sliced chicken and Parmesan cheese. * 1 chicken bullion cube or 1 teaspoon chicken bouillon powder or bouillon base. **Every pasta brand is going to need a different amount of liquid, so it is nearly impossible to predict how much you will need to get cooked pasta without being overly watery. Start with the 3 1/2 cups and while cooking and stirring (to prevent sticking to bottom) add more in small increments until pasta is fully cooked to ad dente. 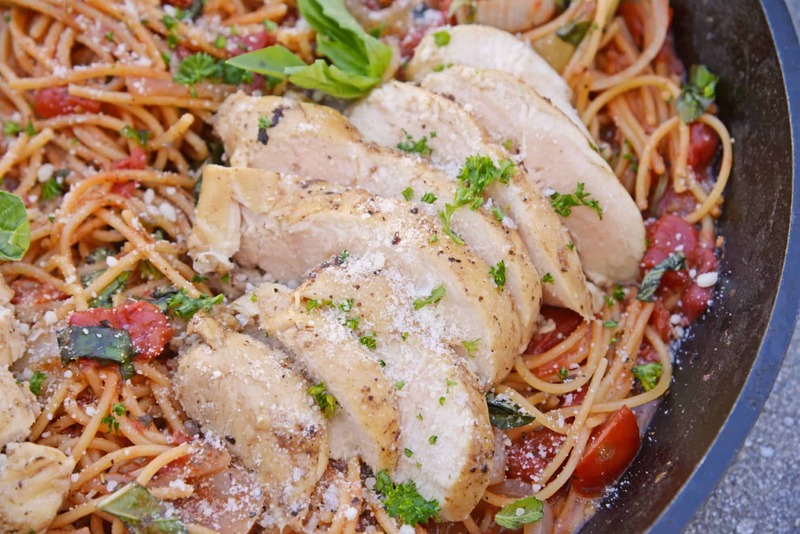 Bruschetta Chicken is one of my favorite dinners – I love your version! I will have to try it!!!!! This is such good comfort food. I will take a big bowl please. I want more 2-hour recipes!! 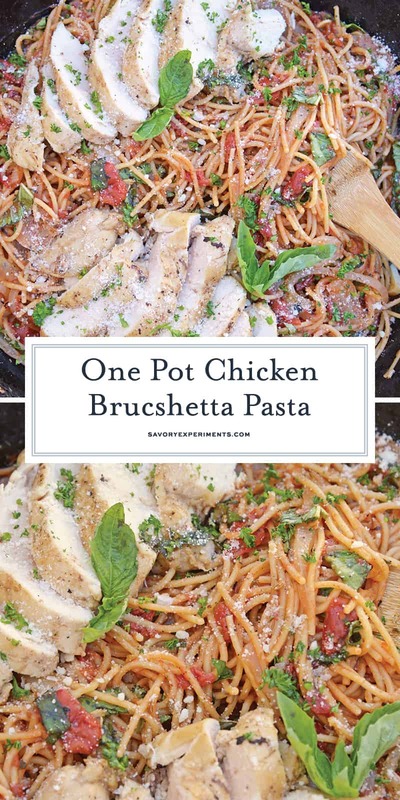 Just kidding 😉 This One Pot CHicken Burschetta Pasta is GORGEOUS – I’m drooling onto my keyboard! Also, I love the step by step instructions. Wonderful! I am now craving pasta and it’s 4 am. Dang you. Lol! This looks like perfection to me. I’m a quick recipe kinda girl myself. This pasta sounds so delicious! Especially love the one-pot part! Haha. Yeah. Don’t need any more 2 hour recipes. 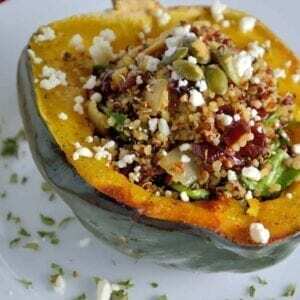 😉 This quick and easy recipe looks great! I love the shortcut. This looks incredibly easy and delicious. I’m actually going to share this recipe with my bachelor son because I think he would really like, and make, this. Thanks for the recipe! I can’t turn down a homemade pasta dish! And one-pot meals are so great to make during the week when every thing is so chaotic.Great idea!! Absolutely LOVE one pot meals, and this looks fantastic! What an awesome one pot wonder meal! This would win with my boys for sure! One pot meals are the BEST! This looks absolutely delicious! 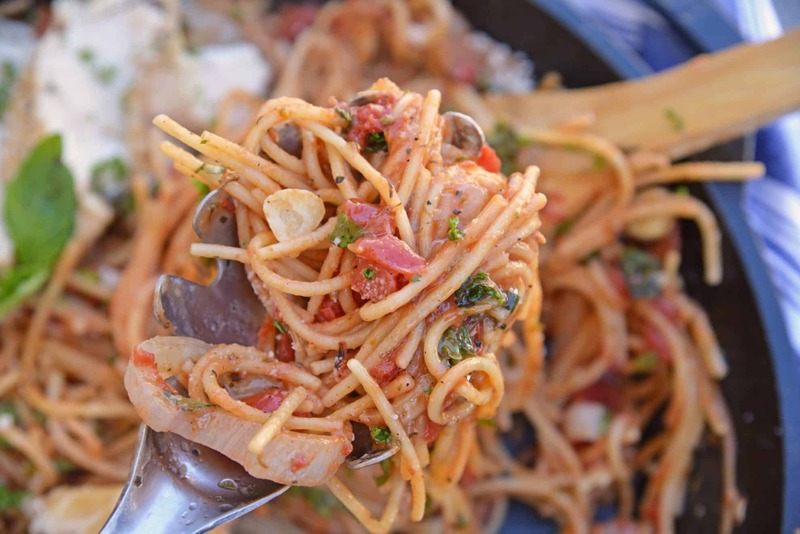 You turned one of my favorites into a pasta dish! I can’t believe how little time this takes to make!